Coming soon a wide selection of non-certified and below 0.50cts diamond engagement rings. Engagement rings are the symbol of your betrothal. Engagement rings feature a diamond, the hardest sustance in existance and the most perfect of gemstones. Traditionally, but not necissarily, worn on the fourth finger of the left hand, the engagement rings' diamond is cradled in a delicate setting. The setting holds the diamond securely while displaying the diamond in it's best light. The choice of shank style and weight finishes engagement rings as items of beauty and a symbol of love. There are almost innumerate options for the style of an engagement ring with different shank styles, different shoulders and different engagement ring setting styles. There are several different diamond shapes and then there is the choice of metal; gold, white gold or platinum. 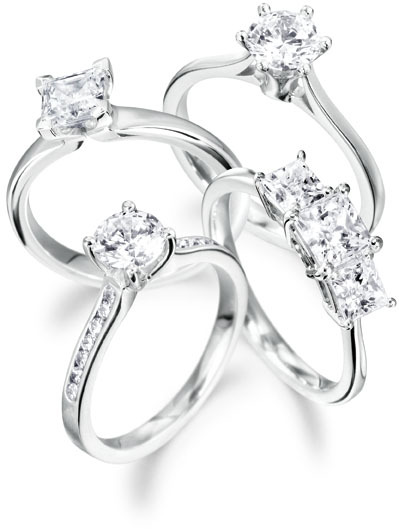 Let us help you choose the perfect engagement ring for you.